The Renova Therapeutics product pipeline is focused on gene and peptide therapies for sufferers of cardiovascular and metabolic diseases. Our lead product, RT-100, is a treatment that delivers a therapeutic gene directly to the heart during a routine outpatient procedure and has the potential to increase heart function in millions of patients with congestive heart failure. 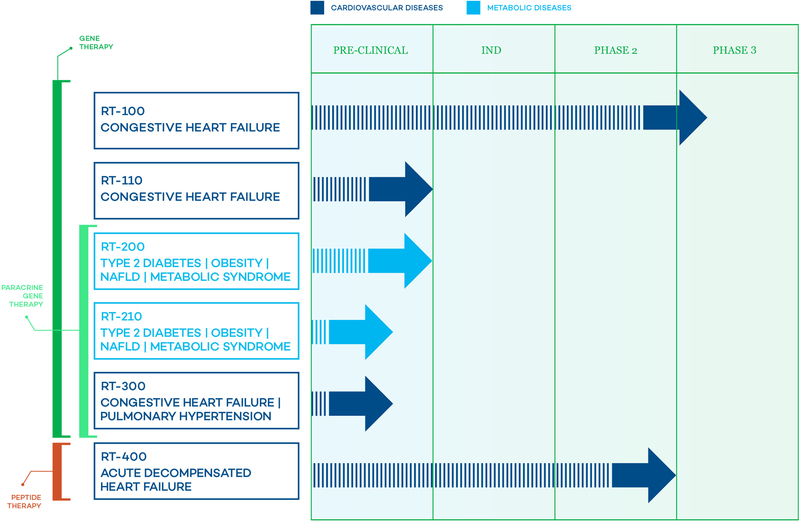 Our product pipeline also includes RT-200, a groundbreaking gene therapy in preclinical stage for sufferers of type 2 diabetes, as well as RT-400, a peptide infusion therapy for the treatment of acute decompensated heart failure.